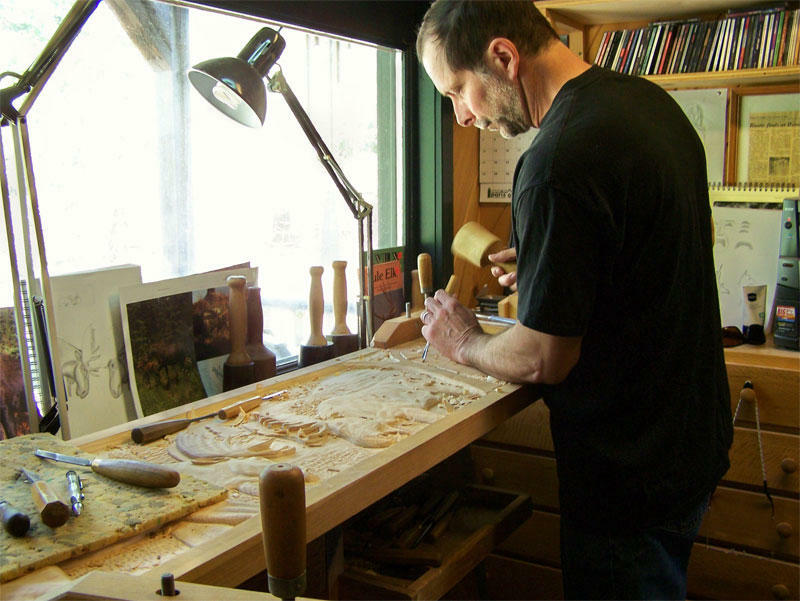 Sculptor William Janelle carves a nature-inspired scene at his home studio in Bridgton. William Janelle, a Bridgton-based sculptor, is displaying two of his bird carvings during the month of May at the Gisland Farm Audubon Center in Falmouth. One piece, titled “Attracting Birds” is a cardinal standing on birding books, and the second is of a blue jay. Both pieces are carved from butternut wood and painted with oils. Janelle, who is trained in construction and has worked both as a carpenter and as a self-taught artist for close to four decades, moved to working full time on his art four years ago. He primarily carves birds and other wildlife using a method called “subtractive sculpting,” which involves chipping at a block of wood using hand tools. Janelle, whose works are displayed all over the state, including Hole in the Wall Studioworks in Raymond, answered a few questions about his art for the Lakes Region Weekly. Q: How did you become interested in wood carving? A: I was introduced to wood carving at age 14, for a high school project. I went to Thornton Academy in Saco. My industrial arts teacher was a bird carver and our assignment was to carve a duck. My great-grandfather used to carve, as well – his style was a bit more rustic – so that also spurred me onto wood carving. After that assignment in high school, basically I carved and kept carving. I have no formal art schooling, but I went to school for building construction. I realized I needed to make money first, and then pursue art when I would be more stable. My art is full time now. Throughout the last 36 years, when my art didn’t pan out, I would go back to carpentry. Q: Where do you find inspiration for your art? A: Not to be elusive, but I find it everywhere. (It could be) watching TV, reading a magazine or walking on the beach. For instance, at trivia night the answer to a question was Neptune. This then led me to carve a bearded-faced man into a scallop shell. Q: Did you carve “Attracting Birds” and “Blue Jay” with display at the Audubon in mind? A: No. Rarely do I carve for a specific venue, unless it’s a commission piece. I feel it tends to constrain the subject matter. I wanted to exhibit these two birds at the Maine Audubon, because it was the first time I carved birds from a hardwood and painted them with an oil paint wash coat, much like a stain. This is a different process for me. Usually when I’ve carved birds in the past, they were carved from basswood or tupelo, detailed and painted with acrylics. Q: You’ve said that in your art you try to capture human expression and emotion in wildlife portrayals. Why is that a goal of your art? A: I think art, in general, needs to speak to someone. Often times body language, whether it be an animal or human, can tell a snippet of a story. We often relate to animals on human terms, identifying with characteristics that we ourselves have. Q: What is one of the biggest challenges of working with wood? A: There are so many. Each type of wood has its own pros and cons. Hardness, it’s willingness to split and the speed to which it dries. Each piece of wood can be a joy and a nightmare. You have wonderful straight grain; the shavings peel away like butter, or you can be carving for hours and discover a knot or a rotten spot. With seasonal deviation comes the expansion and contraction of moisture. Even though the tree has been cut and is dead, in a way it still lives on.